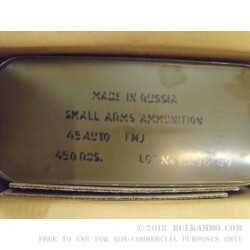 A bulk pack of ammunition sealed in boxes and then in a “spam can” style metal container that reduces the potential for environmental degradation of the ammunition. The air-tight; water-tight container keeps your ammunition easy to store and stack and keeps it from the elements which ensures that corrosion and moisture cannot negatively affect your bulk shooting ammunition. 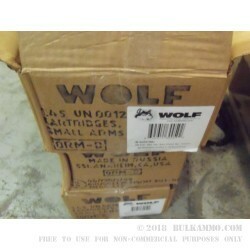 WOLF is an importer model which contracts ammunition from several factories and brings those rounds into the country and handles distribution and marketing. It has found great success in the American shooting market in the past 10+ years and offers a very high-quality cartridge portfolio with a very compelling price point. This .45 ACP ammo is a fine example of just that. 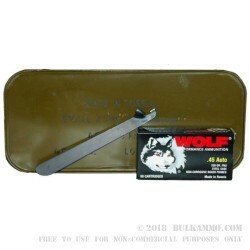 This is a 230 grain full metal jacket load, otherwise lovingly referred to as a “HARDBALL” load with a steel cartridge casing and a Boxer primer. It is technically reloadable but at great difficulty and is best left on the range or disposed of. The performance is in line with standard hardball loads by other producers and despite being very inexpensive, this is a round that can legitimately replace your normal range rounds for most guns in the mainstream production category. Note: it does, by virtue of having a steel case, function better in guns that do not utilize exceptionally tight tolerances for ultra-match type performance.